The parties! The galas! The food! Soooo much food. The Halloween costumes are stashed. The plastic skeletons put away until next year. Aunt Isabel is rifling through the cedar chest in search of the damask table cloth big enough for the family table when all the leaves are inserted. 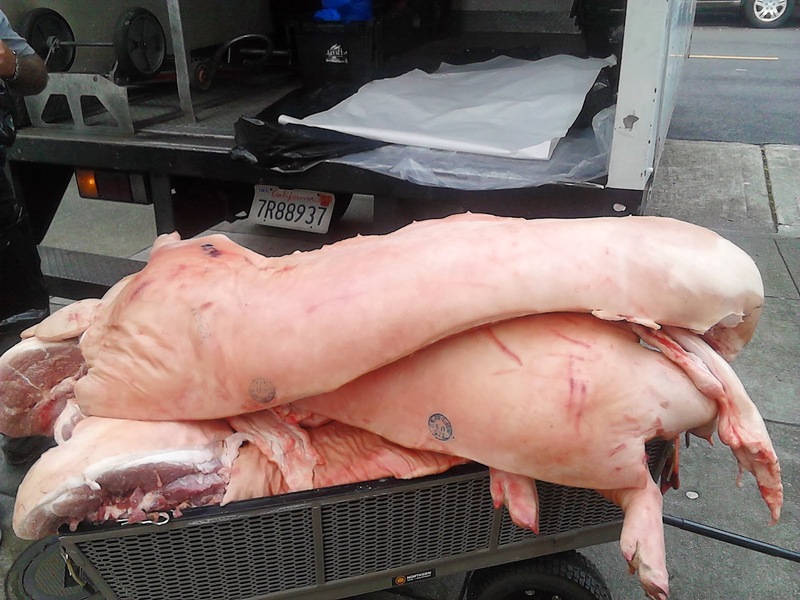 Cousin Matt and his sister Cee have been planning the Thanksgiving menu since July. Candied yams or plain? Traditional stuffing or Cajun style? Visions of fat breasted birds roasted to perfection dance through our heads along with thoughts of the lobster canapes and other delectables bound to turn up at all those swell holiday soirees where gowns sparkle, jewels glitter and revelers revel until the wee hours. The Season of Excess is upon us. Excess for many of us, maybe. But what about the estimated 1/4 of San Francisco's population that struggles to feed themselves and their families on a daily basis? 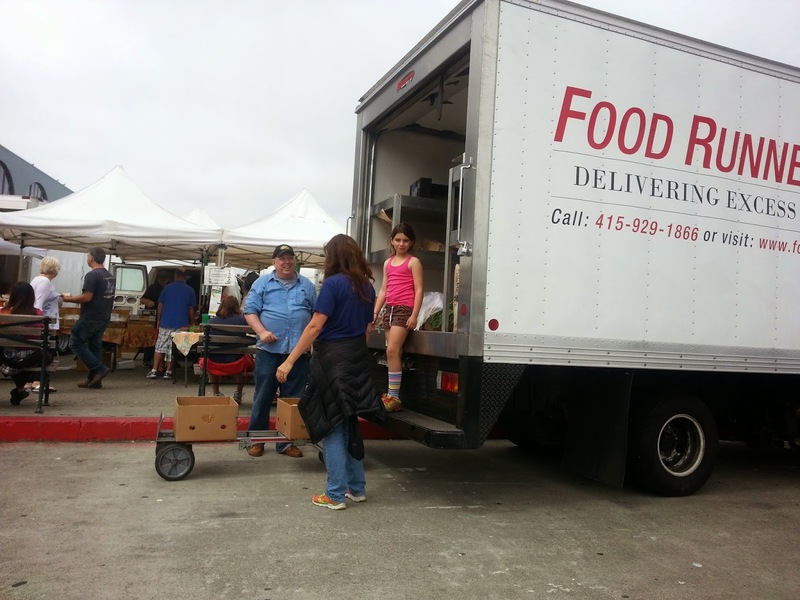 That's approximately 190,000 San Franciscans facing the threat of hunger everyday. It 's not The Season of Excess for them. That's where Food Runners comes in because The Season of Excess is also The Season of Giving. At Food Runners, The Season of Giving lasts 365 days a year, of course, but happily for Food Runners, donations roll in at greater than normal volume duirng the holidays when those in need often feel the pinch the most. 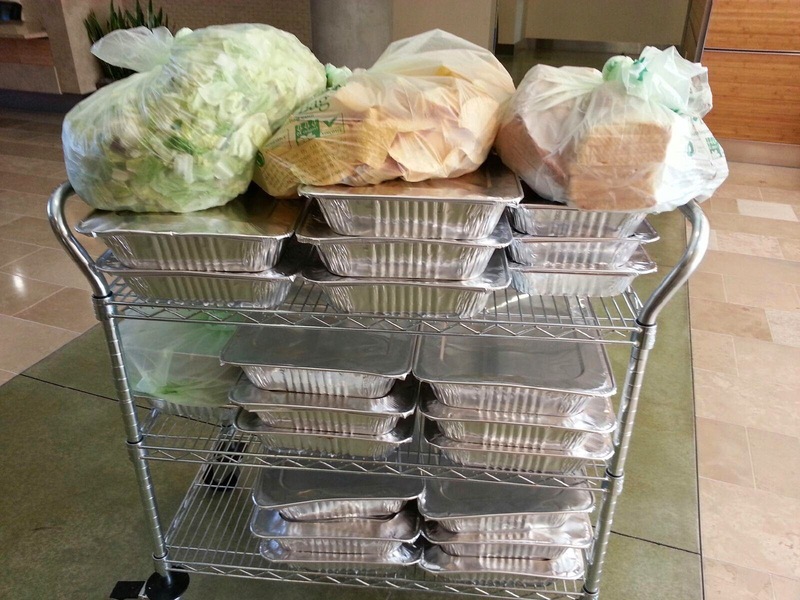 Donations like the 200 brown bag lunches prepared two Thanksgivings in a row by groups of USF students who care. Donations like the the delicious array of cakes, pies and pastries donated annually on Thanksgiving Eve and Christmas Eve by Noe Valley Bakery. In addition, grocery stores like Trader Joe's and Whole Foods donate mind-boggling amounts of "spoils" over the holidays. "Spoils" is grocery store insider lingo for food such as produce that may be slightly damaged or food such as dairy that may be on or just past its "sell by" date. Food that can no longer be sold, but is perfectly safe and edible making it eligible for donation. Food Runners volunteers relish the holiday season. Showing up with food for those in need is gratifying at anytime of the year, but showing up during the holidays with carloads of food twice their normal size is positively heart expanding. 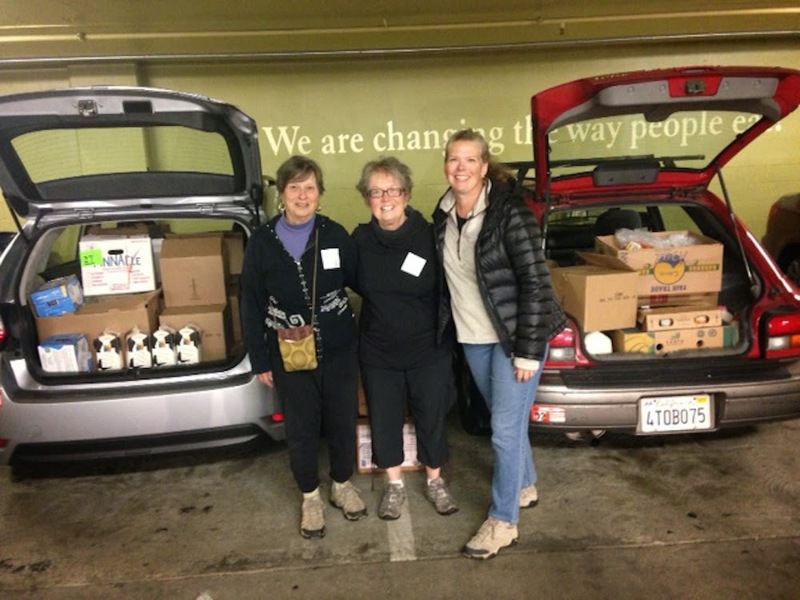 In the words of Food Runners founder Mary Risley, “The volunteers who pick up and deliver the food have an immediate sense of helping others at the most fundamental level. And the recipients have tangible proof that their fellow San Franciscans really care.” What could be more in the holiday spirit? Over the bridges and through the hills, to holiday feasts we go... Do you know what's happening to the leftovers at the all the dinners and parties you'll be attending this season? Tell the host/caterer/event coordinator about Food Runners. Give the gift of food to those who need it most. The Season of Giving at work all year long. The kids had a ball. As did their parents. As did Sam. As did Frank. 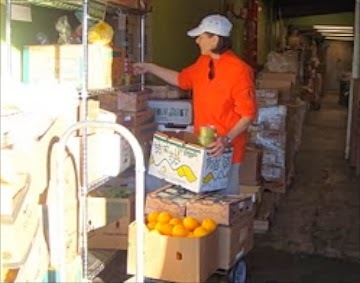 Food Runners volunteers often work alone for the common good of the greater community. But not always. See what happens when volunteers team up. Even more good. Even greater community. Even more fun! "Neither Seth nor I can do our Ferry Building Farmers Market run this week," Keith told dispatch a few weeks ago. "Please find replacements for us." Done. Sam volunteered to drive the Food Runners truck but, his left foot was in a cast rendering it impossible for him to make the rounds collecting vendor's donations as is the protocol. Driving only for Sam. Food collectors needed. Enter volunteers Karyn and Julien and their kids. 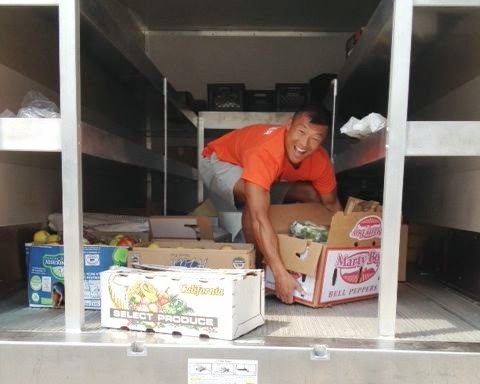 "Great fun at the farmers market pick up on Saturday," raved Frank who assists Keith and Seth regularly and was on site to help direct that day. "Karyn and Julien brought their children which made it special – Sam was great – what an upbeat nice guy! They all made the substitute runner experience a real blast! And an efficient one at that." Go team! "Our truck 'as an oil leak. It will be in zee shop tomorrow," stated Sister Marie Benedict of Fraternite Notre Dame in her beautiful French accent. "We need 'elp bringing zee food and zee tables to and from United Nations Plaza for zee Tuesday night dinner outside." No problem. 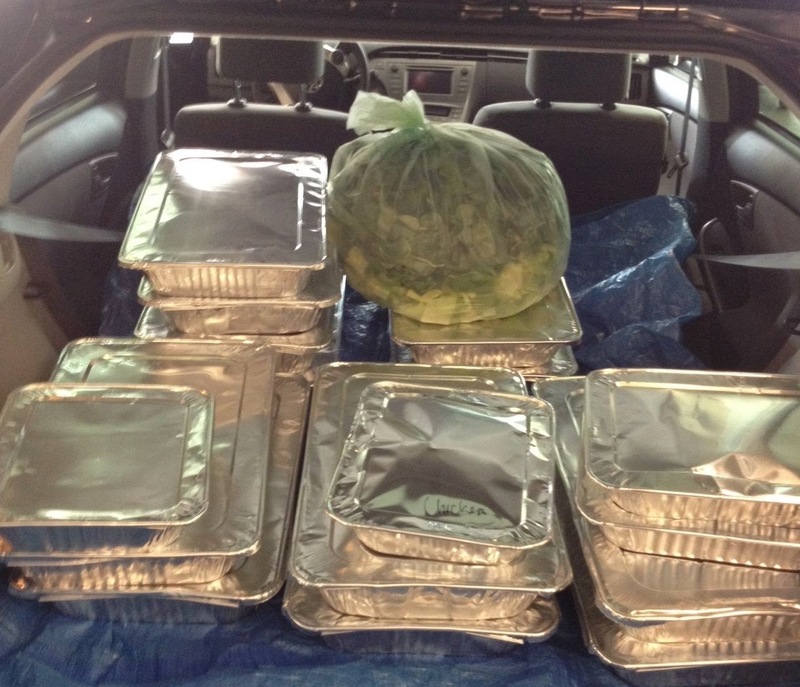 Food Runners made arrangements for transportation aid in a flash. The Food Runners truck arrived at Fraternite at 3PM. Jose, the driver, helped the Sisters load their equipment and food into the truck for the short ride to the UN Plaza. Food Runners returned to the scene at 6PM in the form of a volunteer in a station wagon who happily transported Sister Marie Benedict and the greatly reduced load back to Fraternite Notre Dame. The Sisters passed out over 200 dinners in the plaza that evening thanks in part to the assistance of Food Runners. Go team! "We're at the finish line of the Nike Women's Marathon in Marina Green," explained Rocco of Morningstar Farms last Sunday morning at 11 o'clock. 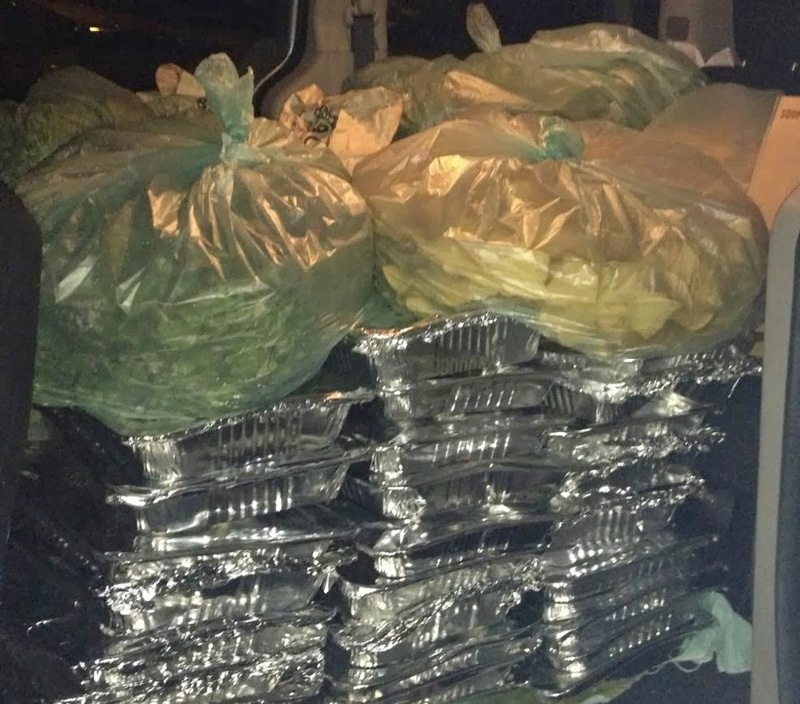 "We have 50 trays of burritos and 80 cases of frozen vegetarian sausage patties along with the buns to go with them. They won't let vehicles into the area until 3. We'd hate to see all this go to waste. Can Food Runners pick it up?" Food Runners sprang into action. At 3PM sharp, three Food Runners volunteers arrived at Marina Green ready to rumble. "Wow," muttered all three when they saw the amount of food. "We need a bigger boat," they collectively thought. 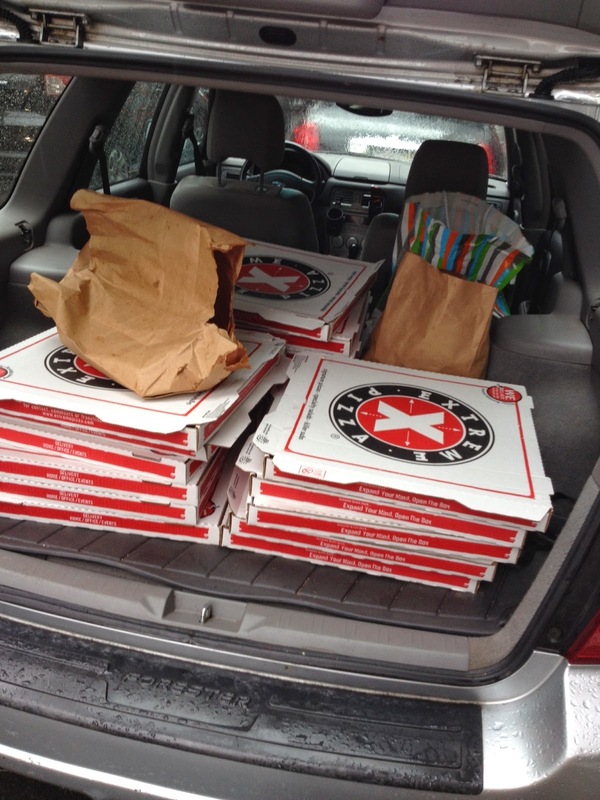 But, 20 minutes later, to everyone's astonishment, everything was loaded up and ready for delivery. 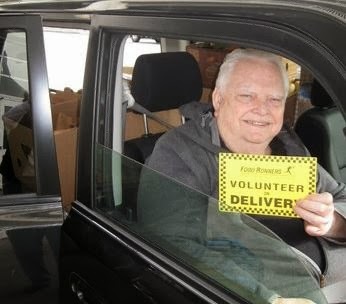 "I'm always amazed at how much food I can fit in my car," stated volunteer William as he stuffed one last case of patties into his mid-sized sedan. "You just have to get creative," William concluded. With that, three cars riding low under the weight of the donations, headed over the hills to their delivery destinations in the Tenderloin, SOMA, Bayview and the Mission. "The burritos were fantastic," reported Sadie from Ellis Street Senior Community. "There were enough for everyone to take two. Dinner today and dinner tomorrow. Dinner that some of the residents wouldn't have at all without Food Runners. Such a blessing, Food Runners. Thank you." Go team. Alexander the Great said, "Remember, upon the conduct of each depends the fate of all." Nothing could be truer at Food Runners: whether working alone or in groups. Go Team! The office is airy. It's bright. The ceilings soar. Industrial light fixtures hang from exposed metal girders. A white reception desk topped with brushed steel rises from spotless wood flooring. In the waiting area, two enormous, deep leather chairs promise to make any wait time incurred feel like a trip to the spa. A state of the art kitchen stands towards the back opposite a play area where two calculatedly disheveled young men engage in a casual game of ping-pong. A similarly styled colleague sways gently in a nearby wicker swing observing the afternoon match. The clack of fingertips tapping on computer keys wafts through the doorway of a large open room filled with round desks, monitors and multitudes of 'team members' staring intently at screens. Welcome to the new age work world where all the comforts of home are at your fingertips, including your meals. Free meals make employees happy. And happiness translates into increased productivity. Healthy food choices matter too. "Many studies show that eating healthier foods leads to more activity, more concentration, more energy and better overall health," says Glassdoor spokesman Scott Dobroski. "Racing to the nearby deli can also eat up time that might otherwise be spent chatting business with colleagues over in-house cuisine." Typical donation from 1st year (2009) of our 1st tech company ever: Zynga. All this in-house meal service makes for a Food Runners bonanza in the form of leftovers upon leftovers upon leftovers -- day in, day out. From well established megasaurs like Twitter, Zynga and Cisco Meraki, who serve in state-of-the-art corporate cafeterias, to smaller firms like Open DNS (described above) Udemy, Zephyr Health, ZenPayroll, Sauce Labs and Venmo just to name a few, who order in catered meals on a regular basis. "We held a mini-hackathon yesterday and it was impossible to know how many people would show up," stated the office manager at a sleek SOMA start-up. Result:75 individually wrapped sandwiches donated to Food Runners. "We order catered lunch daily," explains MR from a start up on the other side of Market. "There are 47 people in the office and we order for all 47 everyday. But then people get called to away to lunch meetings or are on a diet or just don't care for the meal du jour. 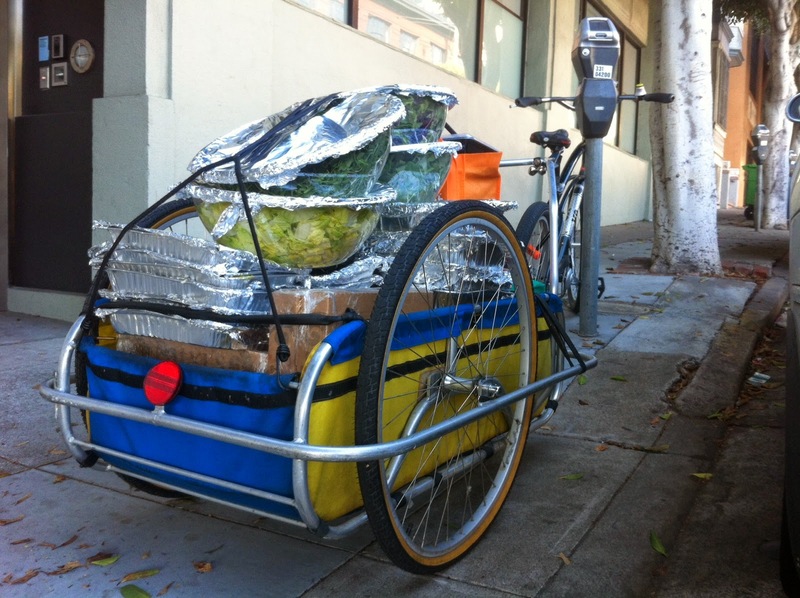 I'm so glad that Food Runners can get the excess food to where it's needed." 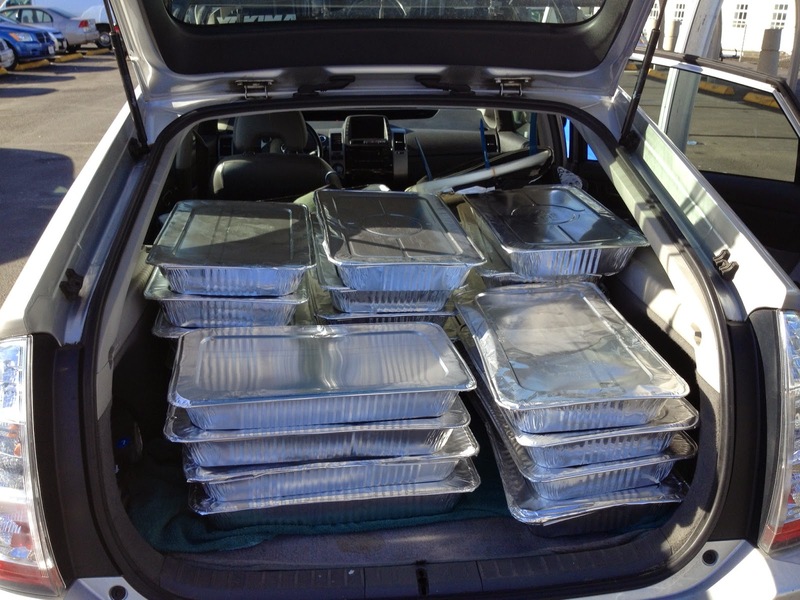 Result: 3-5 trays of meal o' day donated to Food Runners. "I prepare lunch every day for a number equivalent to 90% of our total workforce," remarks the head chef at a corporate cafeteria of a large, well-known company. "There is no way of knowing in advance how many employees will eat in-house on a given day and how many will go out. I can't be caught without, so there are always leftovers." Leftovers indeed. Result: an average of 10-20 trays (equivalent to 50-100 meals) donated to Food Runners daily, M-F.
20 trays looks like this! Starting at around 1:30 every weekday afternoon, the tech company pick up requests flood in fast and furious. These requests are in addition to the already established standing pick up orders at firms like NerdWallet, Crowdtilt, Heroku and many more. 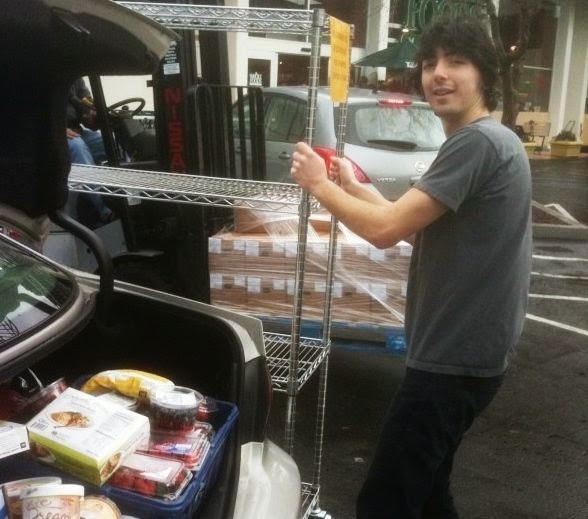 All in all, Food Runners is picking up and delivering an average of 500-750 meals from tech companies on a daily basis. Wow! And the food... the food is gurrrrrr-REAT!!! 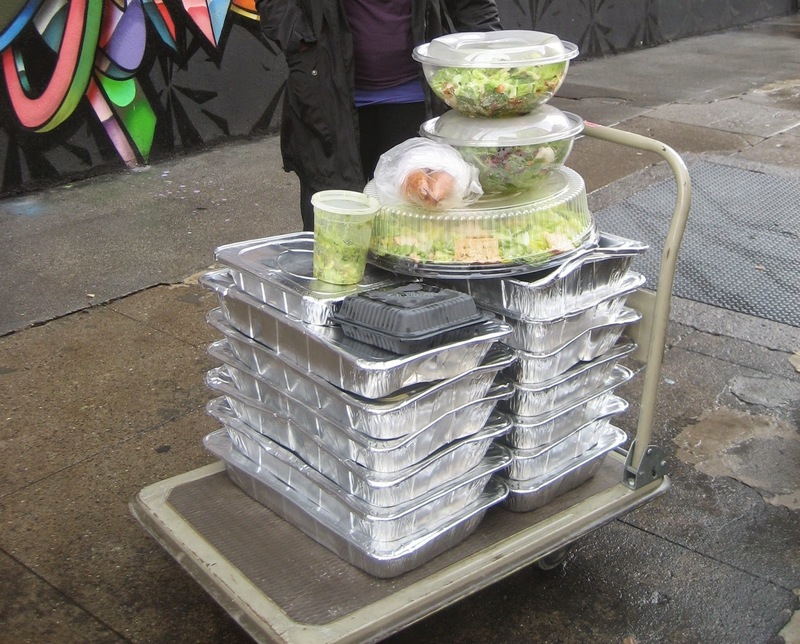 When San Francisco's tech companies call Food Runners, they are shining stars in taking good care of their community. Food Runners recipients like City Team, who serves free dinner, Tu-Sat to anyone who shows up at their doorstep located in the heart of the 6th Street corridor, loves it when a Food Runners pulls up laden with tech company leftovers. 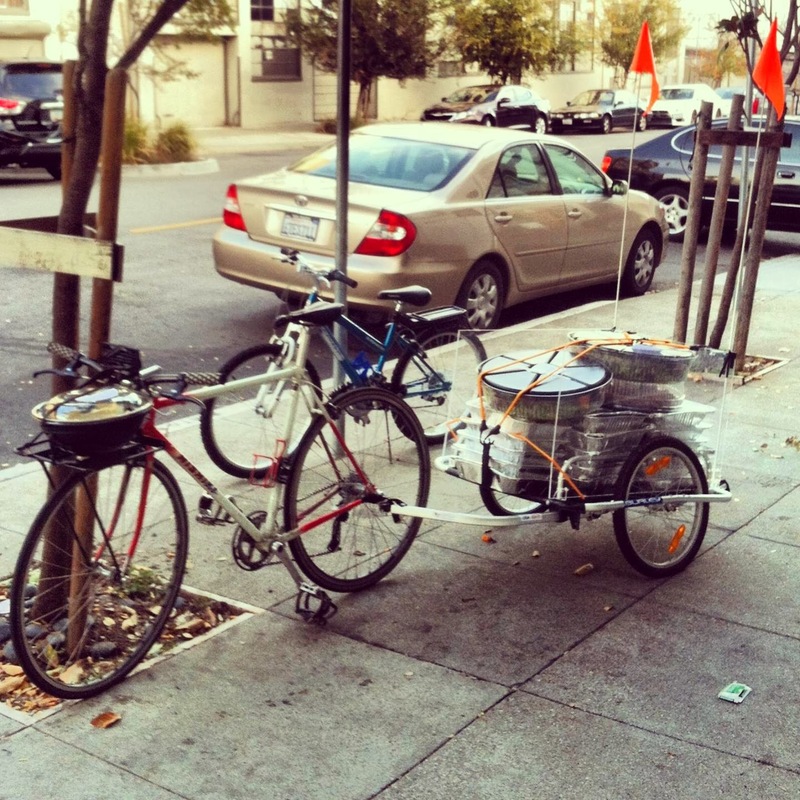 Food Runners and San Francisco's tech companies: a partnership made in heaven! Does your company serve in-house meals? What's happening to the leftovers? A simple phone call to 415-929-1866 will keep your company's food out of the garbage and into the mouths of San Franciscans in need. 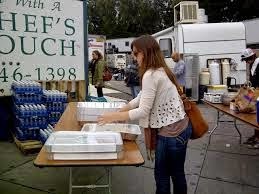 It is estimated that 197,000 people in San Francisco struggle each day to feed themselves and their families. Food Runners is part of the solution. Tell everyone you know. "How much is that sweatshirt in the window," asked the shivering, tank-topped lady from Iowa while waiting for the cable car at Union Square. "No one told me it would be so cold here." Welcome to summer in San Francisco. It's cold. It's gray. It's windy. All summer long. But not at Food Runners where great summer events keep things hot, hot, hot. "You mean "BEER" Fest, right?" That's what everyone says. No. It's "BREAST" Fest. Fer real. It IS a beer festival, but it's all about helping the Charlotte Maxwell Clinic, a state licensed non-profit clinic offering alternative medical treatments for low-income women diagnosed with breast cancer. 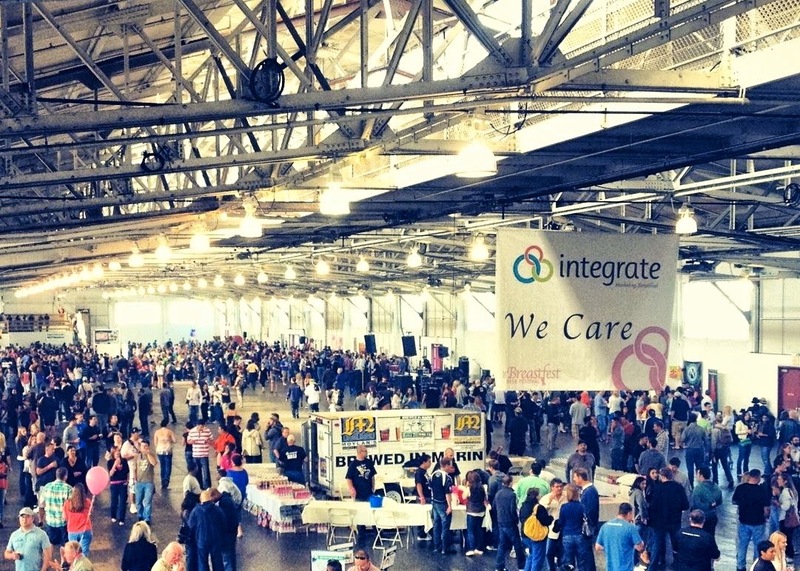 It's a wonderful party and Food Runners will be on hand at the Fort Mason Festival Pavilion the night of July 12th to pick up Breast Fest's excess food. Food Runners will be back at Fort Mason the first weekend in August to pick up the delectables leftover from Eat Drink SF, San Francisco’s annual food, wine and spirits festival (formerly known as SF Chefs). Imagine the homeless women resting on their pallets-for-a-night at A Woman's Place feasting on lobster rolls at midnight as the fog horns moan over the bay. That's the kind of music this epic foodie festival and will Food Runners make together. The music continues when, by noon on August 8th, throngs of people will stream into Golden Gate Park. Over amped strains of rock n' roll will shatter the relative peace of the neighborhoods west of Crossover Drive. Outside Lands 2014 will be underway. Three loud, crowded days of it. An average of 60,000 concert goers are expected to attend each day. That's a lot of people in need of food. Food that will be supplied by vendors like Escape from New York Pizza, 4505 Meats, DeLessio Market & Bakery and many, many more. In addition, the festival's artists and tech crew of over 150 require three full meals daily which will be catered to perfection by Chef's Touch Catering. All put together, there will be mountains of food likely to generate mountains of leftovers; all to be picked up by Food Runners. It's a big operation involving all kinds of security measures, expert coordination and complicated logistics on the part of the festival staff who are excited be to be partnering with Food Runners for the fourth year in a row. On the other side of town... the very next weekend... Food Runners volunteers will be on scene at the close of La Cocina's fifth annual Street Food Festival. This event once again promises excellent donations from the many vendors participating. 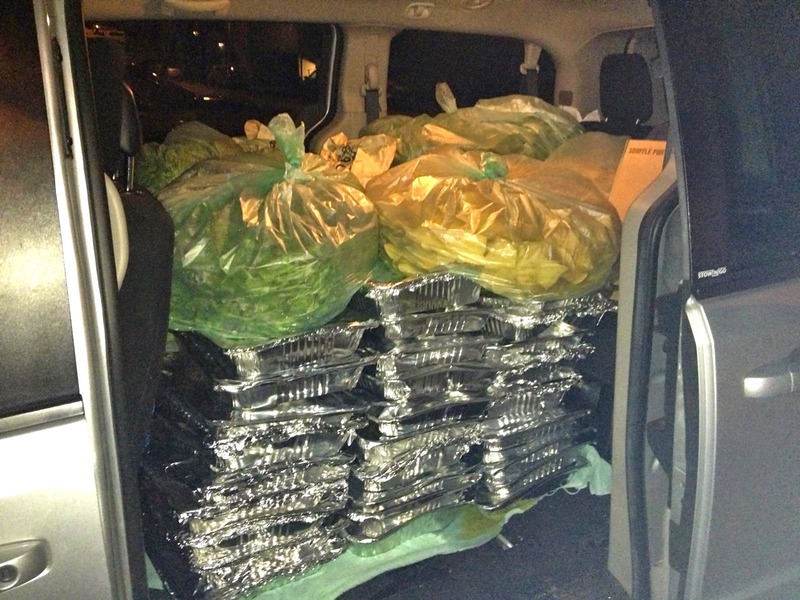 Last year's donations totaled three vans full of fantastic food. Eager volunteers happily picked up the donations for delivery to agencies serving those in need including HCHS Mother Brown's Dining Room, Fraternite Notre Dame, Martin DePorres, City Team and more. Get out your parkas and rub your cold hands together for another amazing San Francisco summer of food. If you know of events where food plays a part, call Food Runners. 415-929-1866. Food Runners will make sure that excess food from this summer's events stays out of the compost bin and gets to people who need it most. 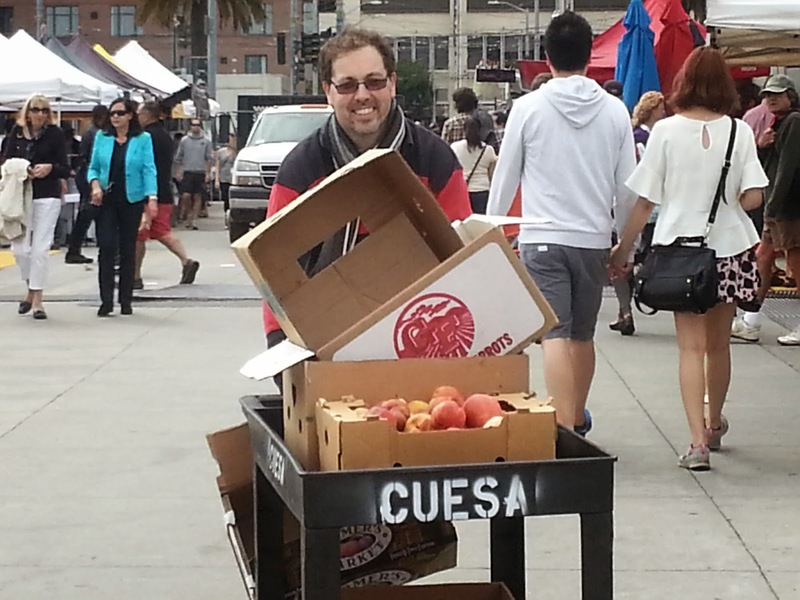 Food Runners is a simple way to warm up San Francisco's famously frigid "fog days of summer." With all the new found wealth and prosperity pouring into San Francisco, do you ever find yourself thinking about those in need? Do you find yourself thinking about ways to give back? Have you ever wondered about what goes on during a food run and why people become Food Runners volunteers? Let Food Runners volunteers give you the lowdown.... the fun, the funny and the inspirational. "On the way to our pick up [Fillmore Street Farmers Market], we noticed a very low rear tire... called AAA and limped into a repair shop on Divisadero. I explained that we had to get moving because we had to pick up food for the needy by 1PM or it would be thrown away. When I mentioned that the food was going to Walden House, the gent dealing with our tire lit up and said he was a graduate from Asian American Recovery Services [also a Food Runners recipient] and a big fan of the Walden House program which is under the same umbrella organization as Asian American Recovery Services. We were very worried that we'd never make it to the market in time, but we were out in 15 minutes with a fixed tire. Oh, the power of the name of Food Runners and its beneficiaries!" "I just want to say how impressed I am with all that Food Runners does. 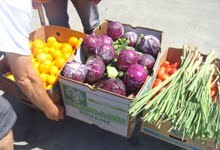 We are so grateful to be able to play a small part in Food Runners enormous good! 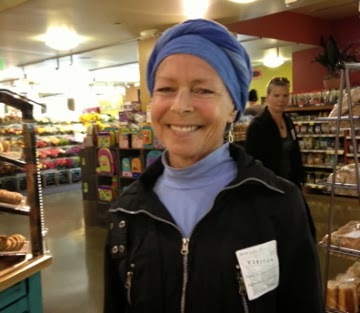 "I just had to share our Trader Joe's experience of today [Feb 16] and how happy it made so many people. 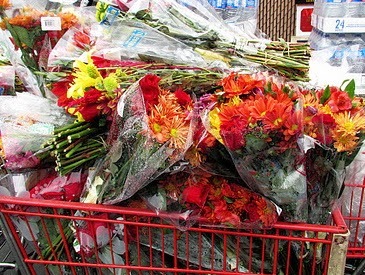 Along with the typical mountain of food donations waiting for us at TJ's, there were 4 shopping carts completely filled with flowers left over from Valentine's Day. We delivered the food to to our usual spot where we also left several large, bouquets. The men were thrilled. One of the gents told us he was expecting his mom for a visit that day. He couldn't wait to give her flowers. We brought the remaining flowers to St. Anthony's Dining Room. There were enough to fill the vases on all of the dinner tables and still have tons left over. I got permission from the dining room manager to give every guest a rose as they left. So many smiles, so much joy and so many people saying they couldn't remember the last time someone gave them a flower. Trader Joe's made several thousand people's day today. It was the best Valentine's Day ever even though it was no longer Valentine's Day. While the flowers may not have been food for the belly; today, we delivered food for the soul to some of the hungriest San Franciscans! Thank you for the opportunity, Food Runners." "At Food Runners suggestion, Chef Angelo from Father Alfred sent several guys over to rescue the food. More hands than needed, really, but I'm sure the guys didn't mind getting out for a walk. A stellar gesture on their part and one that likely makes me the Worst. Runner. Ever. I can't believe they had to pick the food up from ME! I will have to figure out a way to make it up to those guys. On the good news end, no car problems on my earlier run. Community Focus positively did cartwheels over over the three big boxes of chicken from Google. As for ole Otto (my car), it took awhile, but I was finally able to get a tow. Thank you for your quick thinking, Food Runners. The food got to where it was needed even in the face of disaster and that's what matters most." "The two food runners who came today absolutely touched my heart! I was blown away by how kind and wonderful they were. It was truly amazing getting a chance to meet them! They told me a little bit about the food drop off that they do in the Tenderloin [the Aarti] and I instantly wanted to know more! Since first connecting with Food Runners last week, I have just had a smile on my face every time I think about what Food Runner does." Nutritious food is still being thrown away every day in San Francisco. 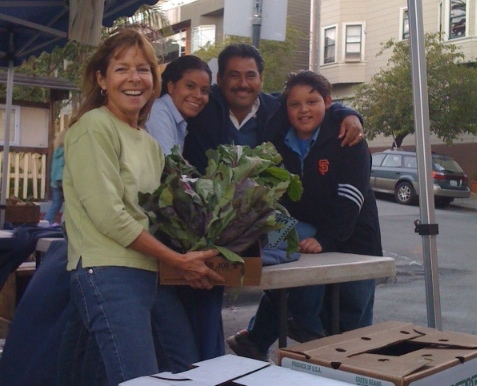 Did you know that approximately 160,000 San Franciscans don't have enough to eat on a daily basis? Tell your friends and local businesses with food about Food Runners. 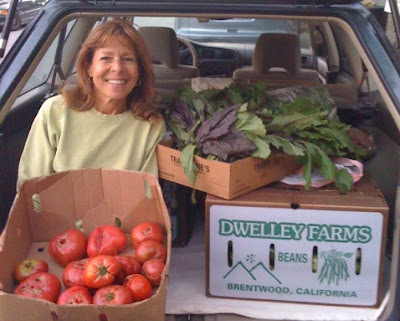 Helping to alleviate hunger and prevent waste is just a phone call away at 415-929-1866.